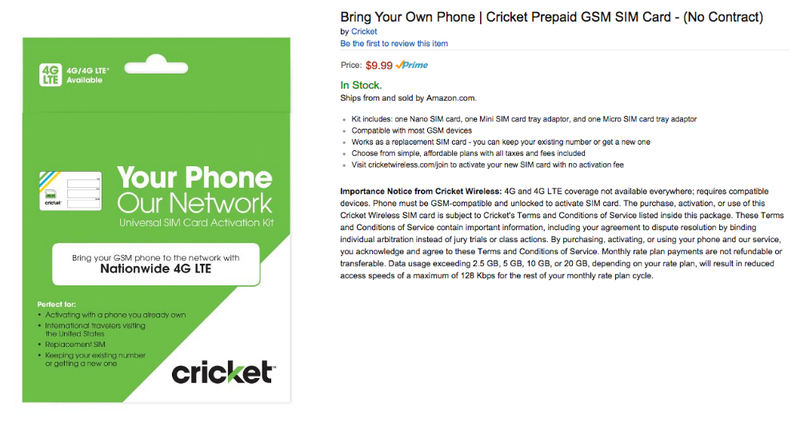 Cricket Wireless announced availability of its BYOD (Bring Your Own Device) Universal SIM Card kit on Amazon this morning, meaning more folks can easily find and take advantage of Cricket’s low data rates and other mobile products, while still utilizing Amazon’s Prime membership benefits. In addition to the Universal SIM Card kit, Cricket is also offering Amazon shoppers to browse and research its plans, such as its popular $35/month plan that includes 2.5GB of high-speed data, as well as unlimited talk and text. Allowing folks to purchase these products on Amazon opens up Cricket’s ability to find even more customers, which of course, is a good thing. If prepaid Cricket service is something that interests you, follow the link below.